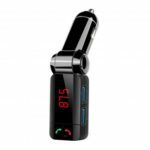 A27 Bluetooth MP3 Player with Car Charger is designed for car. 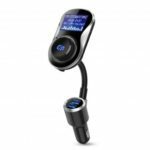 It can decode music files which you download to TF card and USB disk, then transmit to your car stereo through FM transmitter; and enable you to enjoy wireless music via Bluetooth connection. 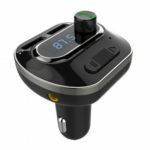 With this car kit, you can also answer and end hands-free calls with built-in microphone, bringing you much fun and convenience. 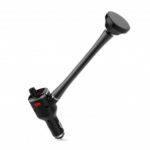 Modulate the frequency the same as that in the car radio, connect your phone and A27 via Bluetooth, then you can enjoy stereo music in your phone and hear clear voice broadcast navigation information through car audio. Equipped with dual USB charging ports, enables charging two devices simultaneously. Support 12-24V input voltage, charging with max. output 5V 2.1A for mobile devices. One key to answer/hang up call and play/pause music. Double click the button to redial call, and twist it to adjust volume or frequency. Bluetooth handsfree call ensures driving safety. Insert your TF card/U disk in the devicet, the MP3 player will auto identify and play music you’ve downloaded. 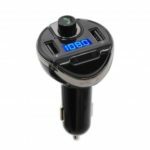 Support line audio input, connect phones, MP3, MP4 with this FM transmitter by 3.5mm audio cable and then transmitting to car audio. Intelligent charging current and real time voltage detecting, overheat protection, ensure charging safety.